With the legend of King Arthur as its theme, this may be one of the most ambitious musical projects ever undertaken by an individual. 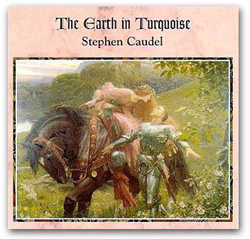 As sole composer, performer, arranger and producer, Stephen Caudel has created a recording of epic proportions, formulating his own unique simulation of full symphony orchestra plus choirs and a Rock Section (up to 70 multi-tracked parts) and adding to this his own emotive Guitar style on both Classical and Electric Guitars. In essence it is a programmatical Rock Symphony based upon the life of King Arthur. Themes and melodies, which recur throughout the piece, represent characters and events, and actions are literally depicted in the music - pictures are 'painted in sound'. This can be heard for example in the first minutes of track 2 'Call of Destiny' which depict Arthur's origins as the son of a Roman General - you can almost see Roman Legions marching! Then there is perhaps the most graphic example of this 'soundscaping' in the final track 'A Legend is Born'. This depicts Arthur's final battle and we actually hear the blow which fells him followed by two poignant farewells, first on Classical then Electric Guitar before, amidst swirling mists, Arthur's body is borne away across the sea to Avalon.